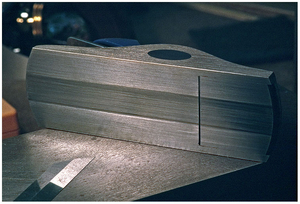 On the 1994 rodbuilders meeting at Corbett Lake Lodge (B.C., Canada) I was talking about putting a groove into a plane's sole without having access to precision machinery like a surface grinder or a milling machine. I encountered that problem several years ago when I learned about the benefits of using planes with a grooved sole to prolong the life of the cutting edge of the plane iron. When I started building bamboo rods, I used the plane as it came off the shelf. I guess most unaware newcomers have done that, and it takes some time or advice from a fellow rodbuilder to realize that there is a better way. The consideration was simple - plane irons got dull very quickly and I ended up spending almost as much time grinding and honing the irons as planing bamboo. Planing steel instead of bamboo (during the final passes of each strip) made the blade dull quicker than necessary. To me the only reasonable solution to that problem was to get the cutting edge off the surface of the planing form. I heard about rodbuilders who milled grooves into the soles of their block planes and swear by it. About 2 1/2 years ago, when I visited my friend John Bokstrom for the first time, I had a look at several planes he has changed and fine tuned especially for planing bamboo. One of them was JohnÂ´s specialty plane with a device with 2 little training wheels, which called a plane leveller (see Planing Form issue # 10, pages 2 - 3). Among other features, this plane also has a grooved sole. Needless to say that the next day I headed for the Lee Valley outlet store to buy myself a #9 1/2 block plane, that John turned it into another "Bokstrom bamboo plane" for me. 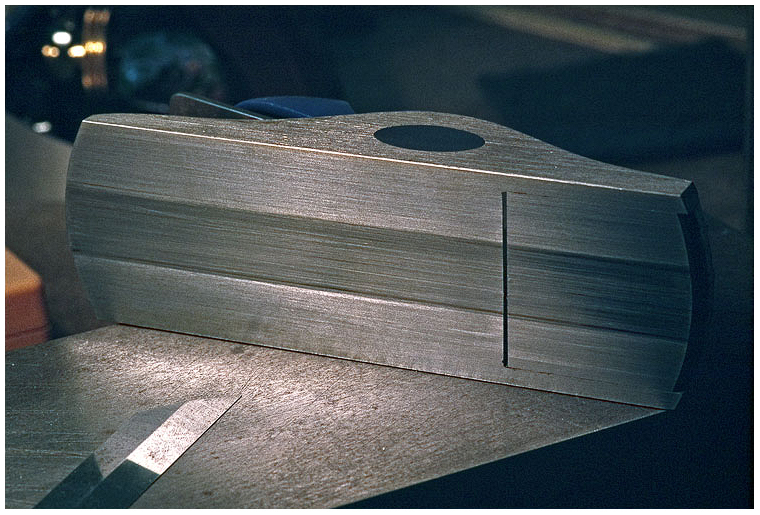 The sole and the groove were done on a milling machine and after removing the cutter marks with fine grit sandpaper and assembling the leveller, the plane was ready to be used. A great, very functional tool that greatly helps to get a very high triangular trueness of the strips planed using it. 1. First of all it saves a great deal of time. Now I am able to plane at least 8 strips before I have to replace the blade with a new, freshly honed one. 2. It usually takes less time to resharpen the blades because they get less dull and have not as many nicks (usually they don't have any). Furthermore only the center of the cutting edge has to be razor sharp. 3. If done properly, and provided the planing form is of high quality, the cutting edge never touches the surface of the planing form, For those who like to use their own, self made planing forms, this means that there is no real necessity to cope with cold rolled or stainless steel. There is the option to use easier to obtain or machine materials to build a second or third set of forms, like brass, hard rock maple, aluminum, Formica, various plastics or whatever might be usable or available.